OMG Posters! » Archive "Duality of Humanity 5" Art Print by Shepard Fairey - OMG Posters! 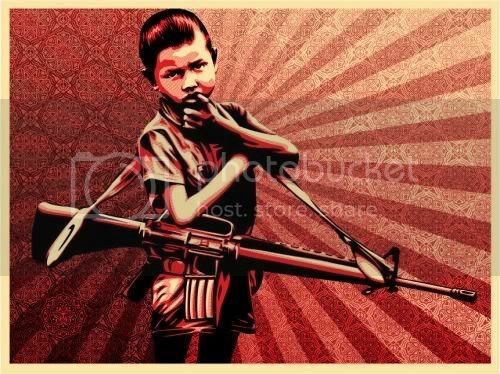 Shepard Fairey and Obey Giant will release the fifth print in the Duality of Humanity series, a collaboration with photographer Al Rockoff. I have to say, I’m really liking this one, anyone else?. It’s an 18″ x 24″ screenprint, has an edition of 450, and will be $50. These go up on Wednesday, June 17th at a random time. Visit ObeyGiant.com. They gave a full 24 hours notice of the change – They changed the release date on Obeys front page but saying that there was allot of confusion. 450 copies is pretty darn high. I wish he would drop it back down to 300. If you have purchased Obey prints in the past, you should know that MOST drops are on Tuesday or Thursday. Of course there have been exceptions.